After the detailed history and workings of the development of capitalism in Capital Volumes I and 2, Marx set out, in Capital Volume 3 to consider the future of capitalism, its direction and its inevitable fall from a series of crises and faults intrinsic to the system itself. Published in 1894, 11 years after the death of Marx himself, Capital Volume 3 was the product of the untiring and meticulous work of Friedrich Engels working from Marx’s outline and notes and carried the subtitle The Process of Capitalist Production as a Whole. In seven parts, Marx and Engels were determined to demonstrate that private property, competition and the market economy driven by the profit motive must lead to the demise of capitalism. They were convinced that only the curbing of the individual profit motive can lead to the end of the mass poverty and the destitution that was evident to Marx, Engels and many others concerned with the social inequities of civilisation continuing throughout history. The conversion of Surplus-Value into Profit and the Rate of Surplus-Value into the Rate of Profit. Conversion of Profit into Average Profit. The Law of the Tendency of the Rate of Profit to Fall. Conversion of Commodity-Capital and Money-Capital into Commercial Capital and Money-Dealing Capital (Merchant's Capital). Division of Profit Into Interest and Profit of Enterprise. Interest Bearing Capital. Transformation of Surplus-Profit into Ground Rent. 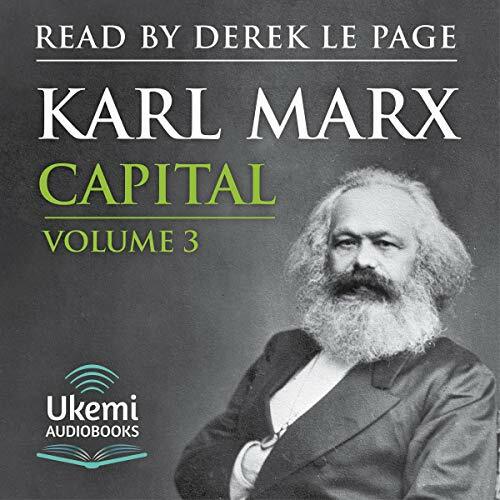 Derek Le Page, in his masterly but temperate reading, sustains and clarifies the arguments and vision of Marx and Engels which had, and continues to have, such an impact on the world. In support of this unabridged recording there is a downloadable PDF which sets out some of the tables used by the authors. Translation: Institute of Marxism-Leninism, Moscow.